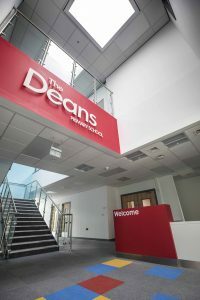 Kingspan Light + Air considers the positive effects of natural daylighting in education environments and discusses how climate-based daylight modelling was used to design a skylight system at The Deans Primary School in Salford. As part of its Better Places for People project, the World Green Building Council compiled two decades of global research into the impact school environments have on students under the age of 18. It discovered that children have a higher sensitivity to light than adults, and the lighting quality can have a notable effect on students’ learning rates, mood and activity levels in and out of school hours. Children can spend up to 40 hours a week in educational buildings. It is therefore vital that both new and existing schools are designed to provide a safe, energy-efficient environment that best facilitates learning and has a positive influence on the wellbeing of both students and staff. Both CIBSE Lighting Guide 5 – Lighting in Schools, and official advice from the Department of Education, stipulate that natural daylight should always be the primary source of light during the operational hours. From a practical point of view, making the most of this ‘free’ light can save up to 80% in artificial lighting demand, helping to minimise long-term running costs and maintain best practice in terms of a sustainable design under schemes such as BREEAM. Access to high levels of natural light helps to reinforce the children’s natural circadian rhythms, making them feel more awake and ready to learn during the day and consequently sleep better at night. This is particularly beneficial in sports halls which are often used for both physical education and exams — situations which require concentration and energy. There are many other health benefits associated with exposure to natural light, such as improving mood and reducing absenteeism due to sickness. At the heart of Kingspan Day-Lite Kapture is an advanced, nano-prismatic layer which uses microscopic structures to efficiently scatter light, ensuring excellent levels of light transmission. Daylight through windows and skylights is also more diffused than artificial ceiling lights, providing a more even illuminance of objects and people. Furthermore, natural daylight contains all the colour wavelengths visible to the human eye, making it the ideal lighting source for colour rendition. This means that pupils in a daylit space will be able to better understand and engage with various visual educational resources presented to them. This is compounded by studies that show significantly higher scores were achieved by students under simulated daylight compared to artificial lighting, in addition to fewer typing errors on computerised tests. Windows are the most obvious point of entry for natural light to enter a space. However, used alone, they are unlikely to provide a uniform distribution of light, particularly in deep classrooms and sports halls. Rooflights have been used within educational building design for decades, particularly as flat-roofed constructions have become increasingly popular. 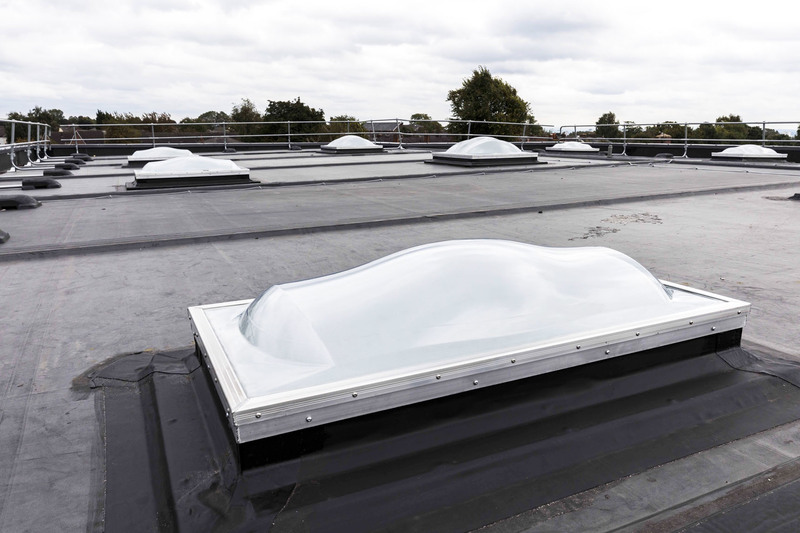 Recent advancements in rooflight technology has focused on refining their often-contoured shape to enable it to capture more light at low sun angles regardless of orientation. This ensures the learning spaces are adequately illuminated for more hours of the day than standard rooflights, thus increasing the students’ exposure to daylight and saving more in artificial light demand. The polycarbonate glazing itself has been developed to guarantee excellent levels of light transmission for the lifetime of the product. Polycarbonate does not filter out blue spectrum light — the colour temperature our brains associate with morning when we are most alert. Other traditional or industrial rooflight materials can yellow over time, blocking out the beneficial blue light waves and distorting the visual environment. Some of the latest rooflights also incorporate layers containing microscopic prism structures which scatter the beams of sunlight, eliminating glare and resulting in a soft natural light ideal for creating a lively atmosphere for learning. Climate control glazing options, including ultra-violet (UV) and infrared (IR) blocking particles, can provide additional protection against solar heat gain, helping to keep the spaces well-lit and thermally comfortable. Due to an increased demand for school places in the local area, the popular primary school was relocated to a purpose-built facility designed by Atkins (a member of the SNC-Lavalin Group) to be energy efficient whilst fostering the best environmental conditions for learning. This included high-quality daylighting within the classroom and corridors to allow students and teachers to work comfortably within bright spaces, which contribute to the overall sense of positivity and wellbeing around the school. To ensure this was realised on the first floor of the building without glare or overheating, the technical team at Kingspan Light + Air used climate-based daylight modelling of the proposed building to design a skylight system, comprising Kingspan Day-Lite Kapture nano-Prismatic Skylights with climate control glazing. The contoured form of the Kapture Skylights (lead image above) allows light to be captured at low sun angles such as in the early morning and late evening, ensuring the internal spaces are illuminated all day. Meanwhile, their advanced nano-prismatic layer uses microscopic prism structures to efficiently scatter beams of sunlight, reducing disruptive glare to avoid a ‘lights-on-blinds-down’ situation. Once the products had been installed, the Kingspan Light + Air team conducted a full site report to confirm the projected daylight levels were reached. The scheme provided over 90% of the floorplan below with uniform natural light, complying with the requirements of CIBSE Lighting Guide 5 Lighting in Schools, and the Education Funding Agency (EFA). The results also showed a Daylight Factor of 5% in the classrooms and 3.5% in the corridor was achieved. 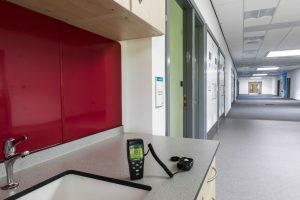 The new school building has also been pre-assessed under BREEAM UK New Construction Non-Domestic Buildings 2014, achieving a ‘Very Good’ rating. Previous : Is social housing one of Scotland’s best kept secrets?